This ultra rare Japanese Promo CD was handed out to Japanese Radiostations and DJ’s to promote Tina’s "Break Every World Tour" in Japan 1988. Tina wasn’t a stranger in Japan. 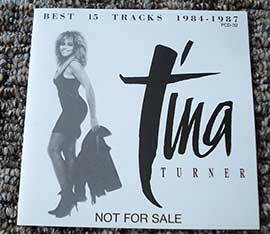 Tina had performed there since the early 70’s with The Ike & Tina Turner Revue. The Revue was the hottest ticket in town, and opened doors for many more American Artists. 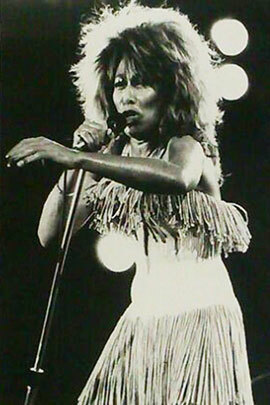 Tina also performed in Japan at the start of her solo career between 1977-1984. She already was a star there, but became a bigger star after the release of the comeback album "Private Dancer". 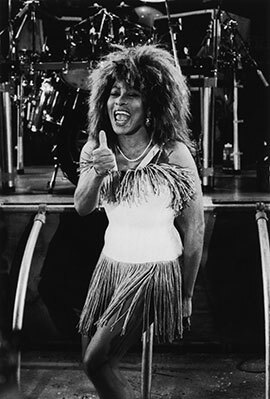 Tina performed during her "Private Dancer Tour" in Japan as well. Here’s a video of Tina performing "What’s Love Got To Do With It" on a Japanese TV Show in 1985. Tina’s "Break Every Rule World Tour" 1987/1988 ended in Japan. Here are the Japanese tourdates from the "Break Every Rule World Tour". As you can see, Tina has been in Japan a lot that tour. She also promoted the tour and her songs on Japanese TV as well. Here’s a clip of Tina performing "Show Some Respect" from 1988 in a Japanese TV Show. This CD is a (live) compilation CD from Tina’s "Private Dancer Album", "Break Every Rule" Album and Tina’s latest album at that time "Tina Live In Europe." 1. Typical Male - 4.15 min. 2. Two People - 4.10 min. 3. What You Get Is What You See - 4.29 min. 4. Break Every Rule - 4.01 min. 5. Paradise Is Here - 5.33 min. 6. Afterglow - 4.26 min. 7. Let's Stay Together - 5.16 min. 8. Help - 4.31 min. 9. What's Love Got To Do With It - 3.49 min. 10. Better Be Good To Me - 5.12 min. 11. Private Dancer - 7.14 min. 12. Show Some Respect - 3.19 min. 13. It's Only Love - 3.33 min. 14. In The Midnight Hour - 3.41 min. 15. Land Of A Thousand Dances - 3.07 min. This Japanese Promo CD isn’t easy to find. You probably find it at record fairs, online auction sites and sites like Discogs.